Holly Perkins is the author of Lift to Get Lean, a strength training guidebook for women, and the founder of Women’s Strength Nation. Holly’s mission is to improve the ratio of women to men strength training in gyms around the world. No one wants flabby arms, but with this workout, all you need is a pair of dumbbells and 10 minutes to sculpt envy-inducing arms. This workout combines biceps and triceps movements in a superset style to give you a super effective arm workout. Each superset is balanced with a move specifically for your shoulders, to make sure you're not just toned but have well-balanced and functional strength as well. Perform each move below for one minute with no rest between any of the sets. You can repeat this workout as many times as you'd like with good form or combine it with any of our other 10-minute workouts, including one for glutes, legs, abs and back. 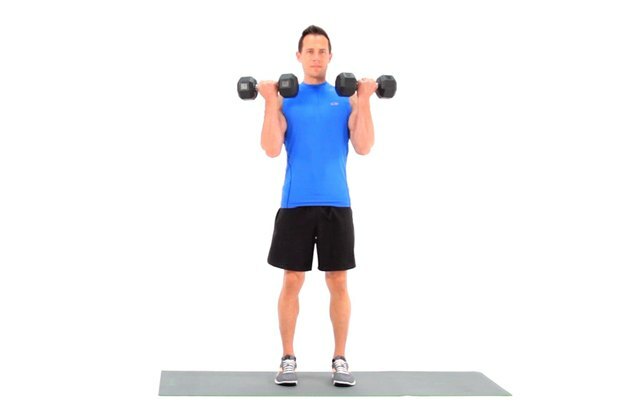 Imagine that your hand is moving the dumbbell around the hinge-joint of your elbow. While a small bit of elbow displacement is ok, try to keep both elbows steady and directly below each shoulder. Pause for a moment and squeeze your biceps when the dumbbell is closest to the shoulder. Focus on resisting the dumbbell on the way down instead of letting it fall. By anchoring your shoulders down toward your hips and away from your ears, you will more fully engage all three muscle heads of the triceps. 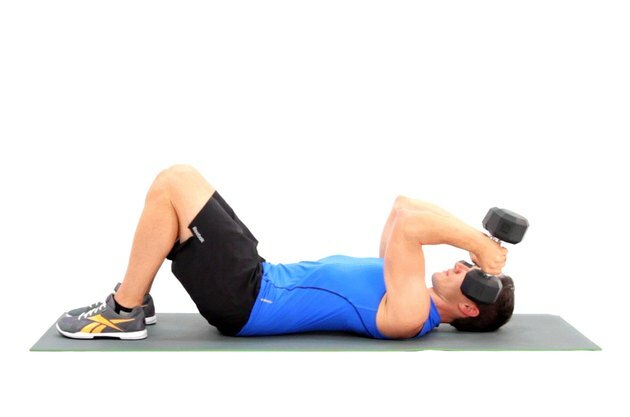 Lying on your back, bring a dumbbell directly over your chest and bend your arms to bring it closer to your head. Throughout the movement, aim to keep your upper arm perfectly perpendicular to the floor. Bend the arms just until your forearm is below parallel to the ground. As you raise and lower your set of dumbbells from your shoulders over your head, keep a long, tall spine and imagine reaching your head toward the sky. 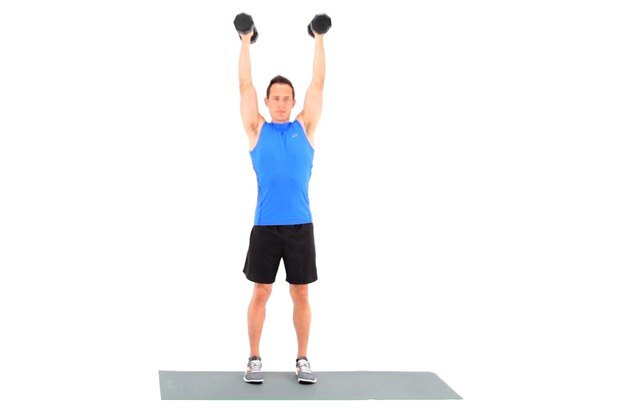 Keep your wrists straight so that the dumbbells are directly over each wrist. End with the dumbbells directly over each shoulder, and shoulders released down towards the ground (avoid shrugging your shoulders). Press your shoulders down toward your hips and away from your ears and lock them there before starting. 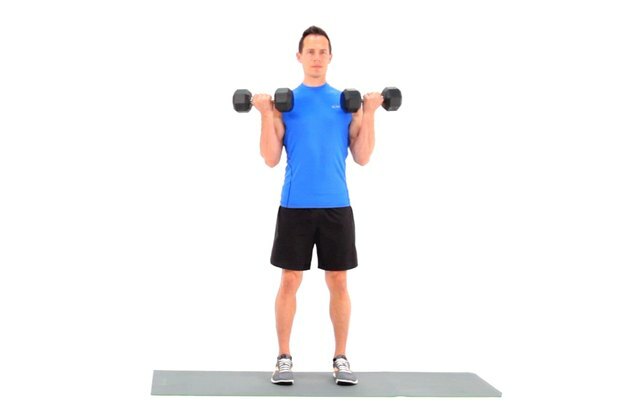 Keep your elbows directly under each shoulder with very little displacement as you raise and lower the set of dumbbells. But unlike the standard curl, you'll rotate your hands from a palms-in position to a palms-up position. Pause at the top of the move and squeeze your biceps when the dumbbell is closest to the front of your shoulder. Similar to they lying triceps extension, this variation requires you to stand the entire time, recruiting more core muscles. Anchor your shoulders down your body toward your hips and lock them there throughout the movement. Aim to keep your elbows directly above each shoulder with only a small amount of forward displacement. Bend your elbows until your forearms are just below parallel to the floor. Start at the beginning and repeat all five moves again for a second set. 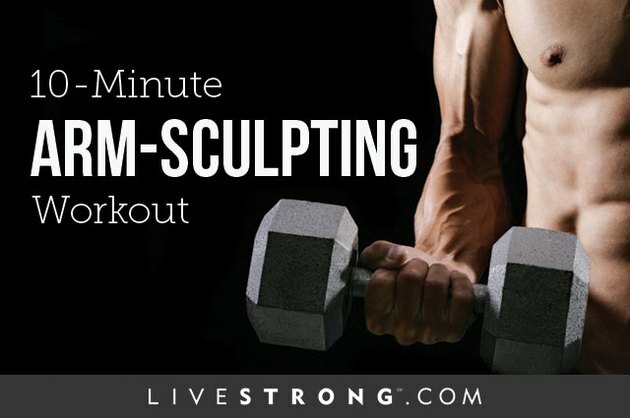 What are your favorite moves for seriously sculpted arms? Which of these do you incorporate into your regular workout? Have you given this workout a try yet? What did you think? Have you tried any of our other 10-minute workouts? What did you think of those? What's your favorite way of combining them? Share your thoughts, suggestions and experiences in the comments section below! Get the videos for these workouts in the LIVESTRONG.COM Calorie Tracker App. Sign up for a Gold Membership today for an ad-free experience and exclusive workout videos!